There’s something soothing about being in a room perched over the water… no matter where you are in the world. 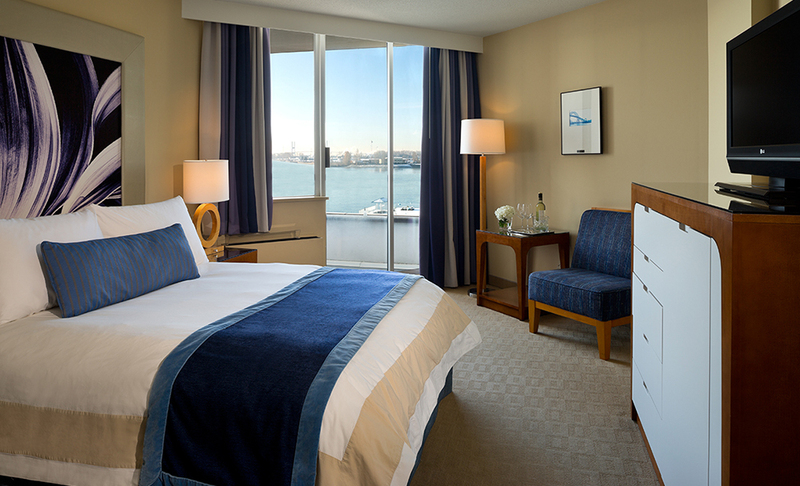 Inn At The Quay hotel’s overwater guestrooms are styled to complement the skyline and water views. They indulge your senses in luxurious comforts. 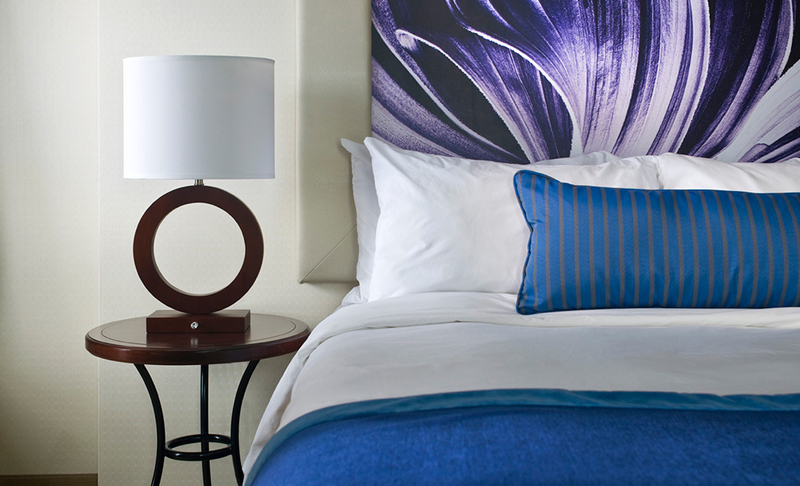 Wrap up in a fluffy robe or take in the spectacular views from the guestroom balconies. Several rooms include a jetted tub for two. Elevate your New Westminster getaway or workcation. When you book a room at the farthest overwater edge of this hotel on the Fraser River, no one can see in so you don’t even need to close the drapes. 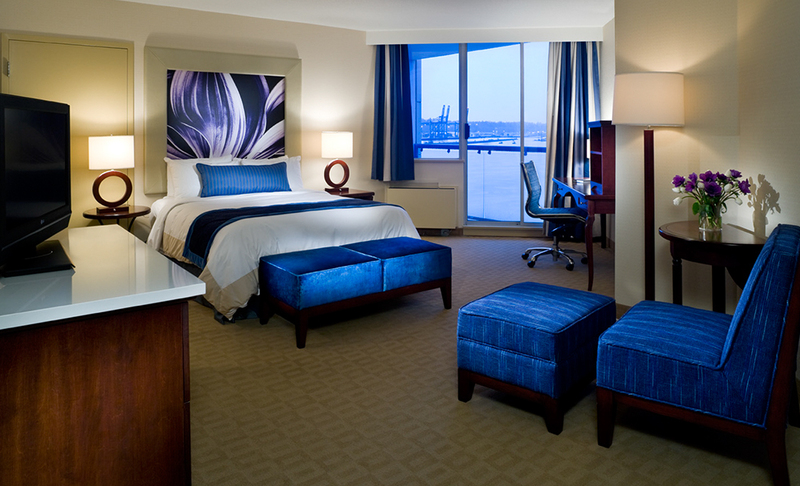 These signature Quay Queen rooms on the 3rd to 9th floors feature one queen bed. No matter if you choose an east-facing or west-facing room you’ll catch either a sunrise or sunset over the river. 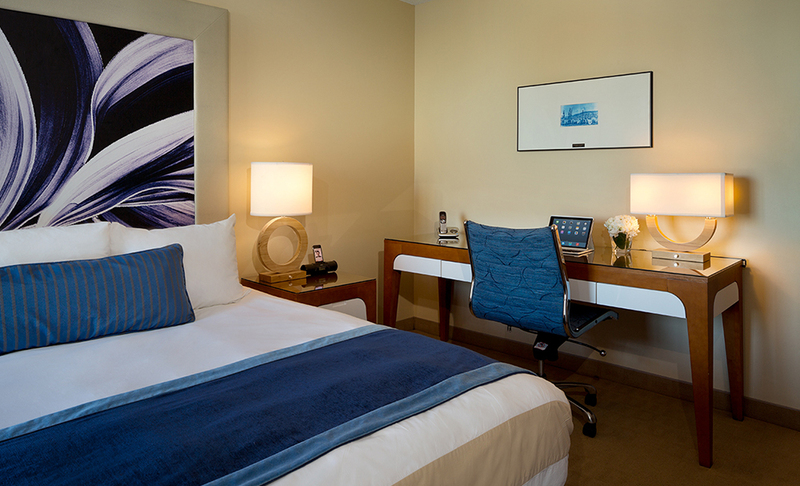 With one king bed, these signature rooms are located on the hotel’s east side on the 3rd to 9th floors. Start your day on your balcony by taking in the sunrise over the Fraser River and people watching at the market. Families have plenty of room to spare in our spacious Quay Twins (Doubles). 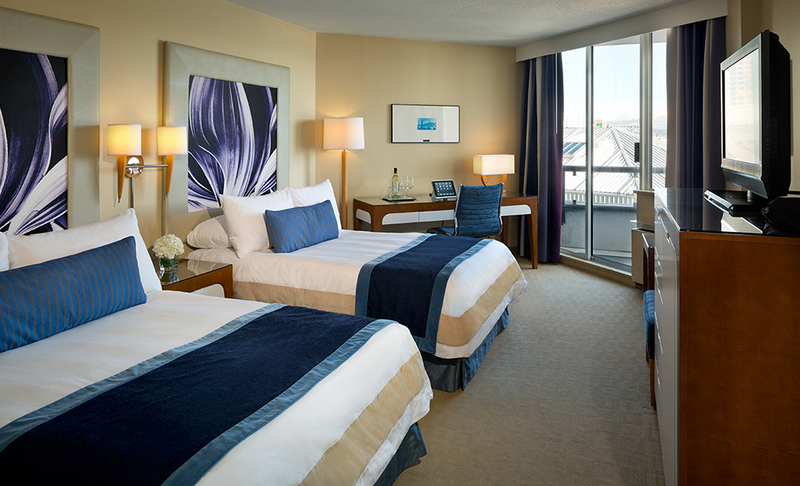 These east-facing signature rooms with two double beds are located high above the Fraser River on the 3rd to 7th floors of the hotel. 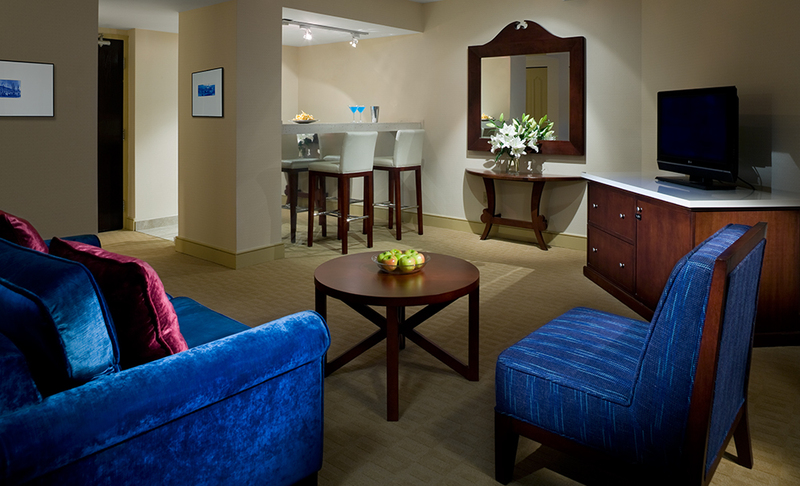 Ideal for small meetings, large families, and for use as a conference hospitality suite or wedding prep area, our hospitality room on the 8th and 9th floor connects to two other guestrooms. It includes chairs, a fridge, TV, queen Murphy bed, bathroom, balcony, and wet bar. Microwaves and stand-up and portable mirrors are available on request. 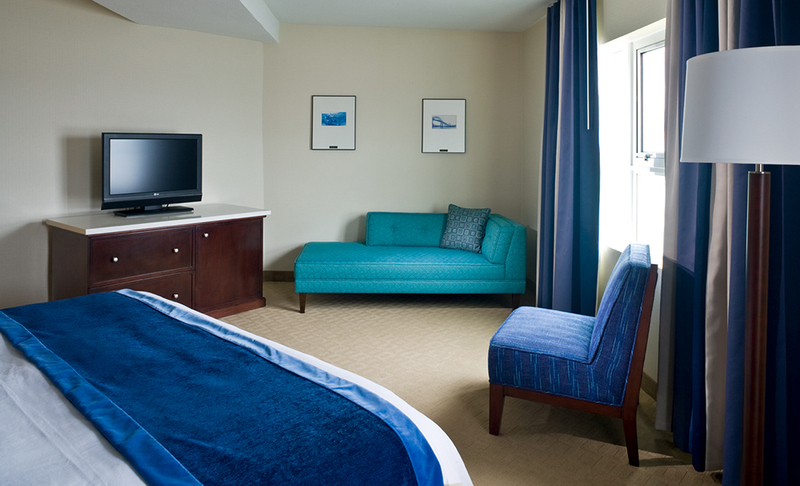 Our ADA-accessible rooms on the 6th and 7th floors offer a queen bed and roll-in shower. Everything can be reached from the wheelchair level. These rooms, located on the 4th, 5th, 6th and 7th west side floors, are an urban oasis. They feature queen beds, a single jetted soaker tub, and spectacular views of tug boats plying the river. You’ll feel like you’re on a cruise ship in these corner rooms at the far end of the hotel, jutting above the Fraser River. The west-facing rooms include a king bed and single Jacuzzi soaker tub. They are located on the 3rd and 4th floors. Our largest, most popular rooms, the King Double Jacuzzis have the most expansive views in the hotel. With a king bed and a Jacuzzi tub for two, the rooms are a favourite among bridal and anniversary couples. Get cozy on the chaise lounge and enjoy an ideal combination of luxury, comfort and value in these rooms located at the farthest overwater edge of the hotel on the 3rd, 4th and 5th floors.